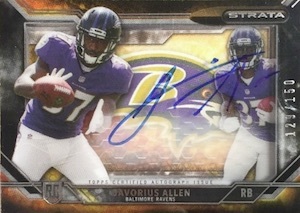 When the Strata brand debuted in 2012, much of the attention revolved around the signature Strata autograph inserts. It was almost as though the base set and the other inserts and basic autographs were forgotten in the mix. 2015 Topps Strata Football goes in a different direction, dropping the base cards and switching to an all-hits configuration. Boxes now come with just two cards that are either autographs or autographed patch cards. The first card is a Clear Cut Autograph Patch Rookie. Mixing a jumbo jersey swatch with acetate, they still have a die-cut spot where the memorabilia can be felt. The signature is signed directly on the acetate. Serial-numbered parallels include Blue, Green, Black, Gold and five different one-of-one Red cards. Red parallels each have a distinct piece of memorabilia include a Nike Swoosh, team patch, laundry tag, glove logo or football piece. Clear Cut Dual Autograph Patch book cards double things up with a pair of autographs. That said, they're the exception and not common as they're all just one-of-ones. 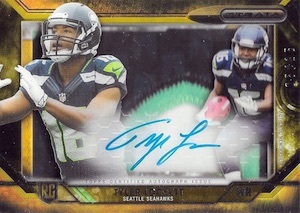 Returning as a case hit are Strata Signature Patch cards. These delve further into the layered look with more acetate to give a shadowbox-like floating effect. Base versions are serial numbered as are Gold parallels (#/25). Rivet versions (1/1) open up to show the different layers involved in the cards' construction. Strata Autographs take a more traditional approach to signed cards. Mixing rookies and veterans, the set has more than 40 signers. Numbered parallels come in five levels, all based on color. Expect one Strata Autograph per box. Strata Signatures are similar to the Strata Signature Patches minus the patch. While the lack the memorabilia, they still have a layered look and on-card signature. One is slated for each 12-box case. Good: On-card signatures, good acetate designs, only autographs. Bad: Some big print runs, weak checklist that is very heavy on rookies, not much high-end talent. The Bottom Line: The reconfigured 2015 Topps Strata Football does not enjoy the same appeal as the baseball version. While the cards look good and hard-signed content is always a plus, high-print autographs and a weaker checklist make it a dicey product to bust by the box. Plus, it doesn’t have the added draw of authenticated relics like baseball. Staying true to the main Strata design, 2015 Topps Strata Football does not stray far and this is a good thing. With literally only four main designs in the entire release, collectors will come across two of them in every box. While the main Strata Autographs design is quite similar to the baseball set, complete with the expected acetate, I appreciated the added foil in the background as it makes the cards pop a bit more. I do find the shape of the Clear Autographed Rookie Relic cutout to be awkward, but I enjoy having direct access to the jersey piece. It is a regular, single-color piece, which is not ideal and certainly not the "Patch" promised on the box, but the swatch is huge. Although I did not hit the other two options, they are largely similar to the main auto relic in both design and orientation. 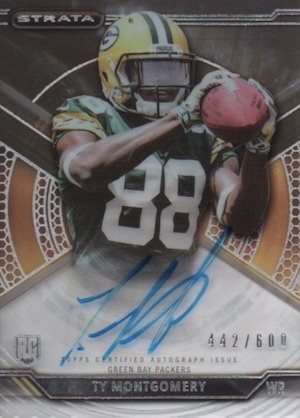 The checklist is a glaring weakness for 2015 Topps Strata Football. First, there are some very big print runs among the main autograph set and, of course, these are for the less desirable subjects. Signed cards numbered to 600 or 800 are tough to accept in a two-pack box. Compounding that issue is the fact that the checklist features almost entirely rookies. Beyond the glut of first-year players, there are very few veterans or retired players. Without a decent amount of veterans/former players, the product is completely at the mercy of the rookie class and high print runs. On top of that, Amari Cooper is a redemption and so are many of the cards for Todd Gurley. Not a huge issue, but given there are only a few top-level players to hit, it would be frustrating to end up with a redemption in a two-card box, even for a big-name player. Value takes a big hit as a result of the checklist. Boxes containing two autographs run for about $55-70 each, which is not terrible in comparison to other hit-only products. However, without a good mix of signers or something unique to set it apart (i.e. authenticated relics), it becomes a less desirable option. This is a good candidate to wait out the box price drop as hard-signed autographs are always in demand with collectors. With two guaranteed autographs, both of which are signed on-card, and a good design, important pieces are in place for a fun break. However, knowing the likely outcome was two rookies, with one sporting a print run of 600+, the fun was slightly dampened. For me, the main excitement in products like this comes from the possibility of something amazing. In that regard, Strata comes up short. Also, it was not ideal that both cards featured the same team (Green Bay Packers), but that is always the gamble. TEVIN COLEMAN 2015 Topps Strata 2 CLR.Jumbo Patch ROOKIE Auto Shadowbox #D 100! 2015 TOPPS STRATA MARCUS MARIOTA ON CARD AUTO PATCH RC #D 1 15! SICK PATCH!!! autos numbered to 800 really? At this price point… the product is egregiously overpriced and underwhelming. Annnnnnd…. that’s all I have to say about that. /800 autos, when you get two cards and it’s the same guy – that’s a problem, lots of no names, not ebough vets. Topps was disappointing this year. Not bad but some cases are full of running backs and not much else. Jonathan � The profile is based on the initial information from the solicitation provided by Topps roughly six months before release. It is not uncommon for certain things to be removed from a product and it appears this happened with the booklets for 2015. Sixty Five dollars for two cards worth maybe five bucks? I bought a box and got two no name players. Out of /800? That’s crazy for a higher end product. 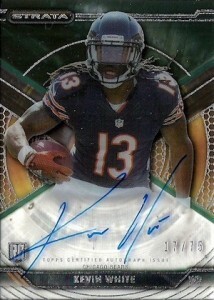 Agree with the other reviewers regarding the high number of auto cards. Nice of Topps but it significantly dilutes the value for money proposition. Cards are nice but best bought on secondary market – you’ll be getting HUGE discounts compared to hobby box price /card values. 65.00 dollars for this product? REALLY!!! Not worth the paper its printed on. As of January of this year (2018) all redemptions for this product expired. I jjust bought 2 Hobby Boxes. 2 David Johnson autos in one. Not bad. Vince Mayle auto and an expired Todd Gurley redemption in the other. Topps will never honor an expired redemption so I have one VERY overpriced Vince Mayle card. I’m done with Topps and any product that features redemptions,even by Panini. We pay for these cards and to have to wait or not get them altogether amounts to these companies ripping us off. 2015 Topps Strata Football Hobby Box (1 Relic & 1 Auto Box) Winston & Mariota !